We worked hard to get this release out before the end of the year. 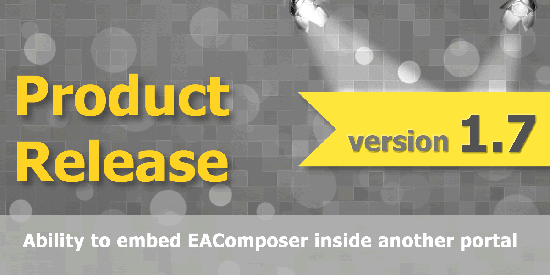 The main new feature is that you can now seamlessly embed EAComposer.com inside an existing portal or website. A lot of organizations have an existing knowledge or employee portal and with this release 1.7 you can seamlessly integrate with that. We will be posting a video toturial on this topic shortly. 1) Each section of eacomposer has a unique URL e.g. Frameworks is accessed via: www.eacomposer.com/solut...ynamic.aspx?s=framework. 3) Using the 'embed' URL means that the EAComposer header/banner is hidden and also the left hand app menu is removed so you are left with the main content. Give it a try and enter for instance embed.eacomposer.com/embed/dynamic.aspx?s=home in your browser. Note that the width and height of the iframe MUST be at least 700 pixels by 700 pixels. If you are running into problems using the embedded mode please contact us and we will be happy to help.